In 1960, the Bathyscaphe Trieste descended to the bottom of the Mariana Trench near Guam, at 10,911 m (35,797 ft; 6.780 mi), the deepest known spot in any ocean. If Mount Everest (8,848 metres) were submerged there, its peak would be more than a mile beneath the surface. The Trieste was retired, and for a while the Japanese remote-operated vehicle (ROV) Kaikō was the only vessel capable of reaching this depth. It was lost at sea in 2003. In May and June 2009, the hybrid-ROV (HROV) Nereus returned to the Challenger Deep for a series of three dives to depths exceeding 10900 meters. Salinity is remarkably constant throughout the deep sea, at about 35 parts per thousand. There are some minor differences in salinity, but none that is ecologically significant, except in the Mediterranean and Red Seas. Organisms in the deep sea are almost entirely reliant upon sinking living and dead organic matter which falls at approximately 100 meters per day. 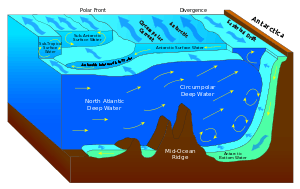 In addition, only about 1-3% of the production from the surface reaches the sea bed mostly in the form of marine snow. Larger food falls, such as whale carcasses, also occur and studies have shown that these may happen more often than currently believed. There are many scavengers that feed primarily or entirely upon large food falls and the distance between whale carcasses is estimated to only be 8 kilometers. In addition, there are a number of filter feeders that feed upon organic particles using tentacles, such as Freyella elegans (see family Freyellidae). The deep sea is an environment completely unfriendly to mankind; it represents one of the least explored areas on Earth. 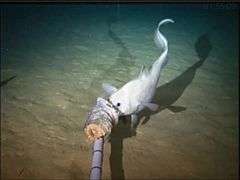 Pressures even in the mesopelagic become too great for traditional exploration methods, demanding alternative approaches for deep sea research. Baited camera stations, small manned submersibles and ROVs (remotely operated vehicles) are three methods utilized to explore the ocean's depths. Because of the difficulty and cost of exploring this zone, current knowledge is limited. Pressure increases at approximately one atmosphere for every 10 meters meaning that some areas of the deep sea can reach pressures of above 1,000 atmospheres. This not only makes great depths very difficult to reach without mechanical aids, but also provides a significant difficulty when attempting to study any organisms that may live in these areas as their cell chemistry will be adapted to such vast pressures. 1 2 Claus Ditlefsen. "About the Marianas" (in Danish) Ingeniøren / Geological Survey of Denmark and Greenland, 2 November 2013. Accessed: 2 November 2013. ↑ Danovaro, Roberto; Antonio Dell'Anno; Cinzia Corinaldesi; Mirko Magagnini; Rachel Noble; Christian Tamburini; Markus Weinbauer (2008-08-28). "Major viral impact on the functioning of benthic deep-sea ecosystems". Nature. 454 (7208): 1084–1087. doi:10.1038/nature07268. PMID 18756250. Retrieved 2009-05-03.